To play the game, start with the numbers showing on all the cards. The first player rolls the two dice. They can turn over the cards which are the same as the numbers rolled. For example, if a 4 and a 5 is rolled, they would turn over the 4 and 5 cards. If a double is thrown, the player's turn ends. They can roll the dice again until they can't turn over any more cards. The cards that are left showing are then added and that is their score. The dice are then passed to the next player who turns the cards the right way up again and then rolls the dice in the same way as player one. They now can keep on rolling dice as long as each time they can turn over some new cards. Remember that if a double is thrown, the player's turn ends. When the player can't turn over any more cards, those that are left are added together and that is the player's score. The winner is the person with the lower score. It can be played with just one turn each or each player can have a number of turns that you decide at the beginning of the game. Golf – A player's score is the sum of the numbers remaining uncovered at the end of his turn. The player with the lowest score wins. Missionary – A player's score is the total number (count) of the tiles remaining uncovered at the end of his turn. For example, a player scores 3 if at the end of his turn 3 tiles remain open. The player with the lowest score wins. Unlucky number 7 – A standard game, when a 7 is rolled, the game stops. 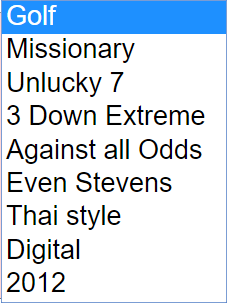 3 down extreme – numbers 1, 2 and 3 are pre dropped, leaving numbers 4 to 9 up. Lucky number 7 – The only number up is 7, and the first person to roll a 7 wins. Against all odds – All odd numbers are up and evens down. Even Stevens – All even numbers are up and odds down. Thai style (Jackpot) – Always roll two dice, but only cover one tile matching one of the dice or their sum. For example, if the dice show a 2 and a 3 you may cover one of 2, 3, or 5. 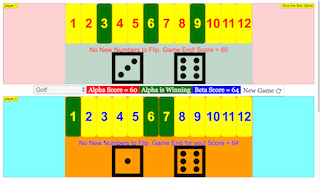 Digital – A player's score at the end of the turn is the number obtained by reading the up digits as a decimal number from left to right. For example, if 1, 2, and 5 are left up the score is 125. 2012 – All 12 are up, but use a 20-sided Dungeons and Dragons die rather than the pair of 6 dice: 20-sided die playing 12 numbers – 2012. This may seem a little geeky, but it adds a new level of excitement to a tired game. Shut the Box, also called Blitz, Bakarat, Canoga, Klackers, Batten Down the Hatches, Kingoball, Trictrac, Cut Throat, Fork Your Neighbor, and Jackpot, is a game of dice for one or more players, commonly played in a group of two to four for stakes. Thai style – Always roll two dice, but only cover one tile matching one of the dice or their sum. For example, if the dice show a 2 and a 3 you may cover one of 2, 3, or 5. 2012 – All 12 are up, but use a 20-sided Dungeons and Dragons die rather than the pair of 6 dice: 20-sided die playing 12 numbers – 2012. Keep rolling until you receive a gameover. The game ends when both plays reach game end.